I hope this letter finds you well. How is your family? Things are pretty good over on this side of the room. Lots of good stuff on Jezebel, etc. Nice weather today, too. See you around the g-chat! You were complaining about never getting any presents in the mail, so…YAY PRESENTS! Anyway, you’ll probably get this while I’m still away. So you’ll have to let me know later how a.) happy, b.) weirded out, or c.) annoyed you were to receive this! P.S. I’m not really sure where this card came from. It’s been sitting on my desk for the last month. I wonder if it’s one of those charity donation things for the artists who paint landscapes or still-lifes [lives?] with their feet. This is the photograph on the front of the card. 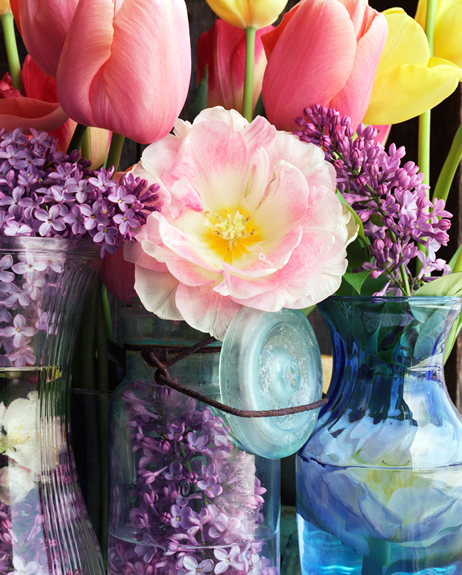 It’s called “Tulip Celebration.” I know this was a joke, but actually I love pink tulips, they’re my favorite flower, and lilacs too, and I only wish that they were more the focus of the photo instead of just the background, but oh well. It was a free card. What cracks me up about this is that two of my coworkers, M1 and M2, took the time to write messages to me, put the card in the mail with a stamp on it, and then when it came in the mail M1 actually walked it over to me herself. What a convoluted plan! That’s love, folks. I am loved. Hi, nice pix, just wanted to say hi and maybe get to know you. Now. I got this request on the Facebook profile linked in the About section of this blog, where I only have one picture, and it is not that nice, frankly, and also, I’m a writer, don’t say “pix” to me, it’s not even a word. Now that we’ve gotten that out of the way, how sketchy is this? Facebook is not MySpace–it is a legitimate social networking site, and I have no interest in using it as a free match.com, although I’m sure some people do. I was confused by this guy because his profile said he worked for the World Health Organization, which, what a random thing to be a lie, right? But otherwise the profile was mostly empty. Anyway, M1 just came over to tell me that she also got a random Facebook friend request from someone with whom she had no friends in common, who only had eight friends entirely, and said something generic and dumb as well. Is this some kind of insidious viral marketing campaign I’m not aware of? Or are these people legitimately just trying to gain our confidence and then bilk us out of our nonexistent millions through some pyramid scheme? Questions to ponder, surely. And in case you were wondering, yes I am posting about random things my coworkers send me via mail and Facebook mysteries because I haven’t yet found the strength to tackle MB revisions. Thanks for asking that awkward question. I’m getting to it. I’m number one in my facebook March Madness pool! Last year I was dead last pretty much the whole way through, because my bracket was basically random and I picked University of Illinois to go all the way, which sucked when they lost in, like, the second round. This year I always picked the top-seeded team to win unless I was attached to the bottom seeded team, which means that I usually sided with California/Pac 10 teams or Jesuit universities, since I went to one (my school isn’t good enough to participate in March Madness, so I never have the urge to, say, put them through to the end despite all odds, like my b-fri Cambria did with USC this year). It’s working out well so far, but I don’t expect to be on top for too long. Still, it’s nice not to be last; that was my goal. As far as I know my roommate and I haven’t gotten an electric bill for March, but our lights are still on. I don’t know. It’s been bugging me. I really doubt we overpaid last month. Now would be a really bad time for my electricity to get cut off. 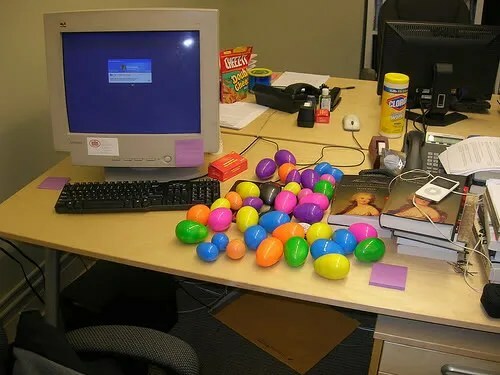 I planned an egg hunt for the people in my office yesterday, and it went really well. I got up super early and went to the office before anybody else got there. It was really strange, because I’m always, like, the last person there in the mornings–so eerily silent. But I hid all the eggs and around 3:00 I set everybody loose hunting for them. I was worried it wouldn’t work out very well because I thought there wouldn’t be enough eggs, or everybody would find them very quickly and it wouldn’t be much fun, or that there would be party poopers. But none of that happened! Actually, they looked for the last egg forever and it was, of course, right in front of their faces; Alex actually picked up the table it was on, didn’t see it, put the table down and it rolled off and into a corner and he STILL didn’t see it. It was pretty awesome. I also got a chance to show off my non-math skills, having miscounted the eggs and then being unable to calculate how many there REALLY were. According to me, 34 is a multiple of six. I’m very embarrassed, but hey, I never professed to be a math whiz. Why does the word “whiz” have an “h” in it when the word “wizard” doesn’t?